The Duke of Kent presented the new colours, on behalf of The Queen to The Gibraltar Regiment. The Presentation of new Colours took place during a parade at Devil's Tower Camp, the home of the Regiment, last Wednesday. "We shall never be expelled by the enemy"
The Colours consists of two banners or flags, one known as The Queen's Colours and the other as The Regimental Colours, the former being the Union Flag and bears in the centre, within a gold circle the inscription The Gibraltar Regiment in gold and the Imperial Crown superimposed. It has two tassels and a suitable staff with a Crown on top. The Regimental Colours bear the Red Cross of St. George on a field of limestone grey. In the centre, round a gold circle within has a wreath of Candytuft (Iberis Gibraltarica  a native flower of Gibraltar which is found in great profusion in the Upper Rock in late winter and spring) the inscription The Gibraltar Regiment with a circle. The Castle Key in red and white (Gibraltar Colours), the Imperial Crown superimposed, underneath a scroll with the Regimental motto Nulli Expugnabilis Hosti (We shall never be expelled by the enemy) and on the upper canton next to the staff a Grenade in gold to denote the link with The Royal Artillery. They measure three feet six inches long by three feet wide. Phil Nelson quoted, "(...) The Queen's Colours (...) being the Union Flag and bears in the centre, within a gold circle the inscription The Gibraltar Regiment in gold and the Imperial Crown superimposed (...)". I have a hard time interpreting this: It seems to mean that the inscription is gold on gold?! And that the crown is over the inscription?! Or am I utterly wrong? With the Regimental Colours it is even worse. From the recent discussions sparkled by the Sarawak flags I posted, I think understood that the golden circle is in the outer part of the wreath. However, I'm not sure how to interpret the "superimposed" word again, and I don't understand where the scroll is supposed to be. Finally, what would the shape of the grenade be? Jorge asks about the Queen's and Regimental Colour of the Gibraltar Regiment. 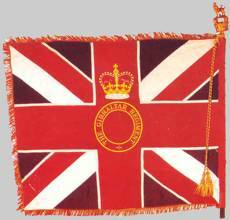 The Gibraltar Regiment is part of the British Army proper, and its Colours conform to British Army regulations. (...) Take a look at the Duke of Cornwall's Light Infantry (DCLI) Colours at Mike Young's British Light Infantry Regiments website. This will give a very good idea of what the Gibraltar Colours look like. For the Regimental Colour, in the DCLI example delete the laurel wreath and battle honour scrolls which seem to pass under the St. George Cross. For the Union Wreath of roses, thistles and shamrocks substitute a Candytuft wreath of the same size. Inside the circlet, again substitute The Gibraltar Regiment. In the center substitute the numeral 'II' with the Castle and Key. This presumably would be almost identical to the old colonial badge in the fly of the ensign. Delete the badge below the wreath and substitute a three part scroll with the words Nulli Expugnabilis Hosti in the three parts. The scroll probably extends slightly beyond the bar of the red cross and curls upwards following the contour of the wreath. The Crown again should have a dropped center. For the grenade, see the one depicted at The Grenadier Guards page. The flames of the grenade should not extend sideways beyond the edge of the ball, and be a bit more elongated vertically. The grenade should vertically fill about one half of the white canton, and be quite close to the corner. Just to complete the information about the Gibraltar Regiment Colours. The stand of two Colours (Queen's and Regimental) was presented to the Gibraltar Regiment at their home base (Devil's Tower) on 1 July 1998 by the Duke of Kent on behalf of Queen Elizabeth II. This was a replacement for the first stand of Colours presented 25 Sept. 1971 by then Governor Sir Varyl Begg. 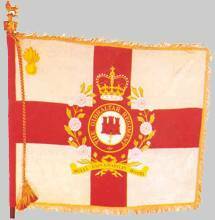 The regiment was formed in August 1958 by reorganising the Gibraltar Defence Force which had been formed in April 1939. The Regimental Colour shows the red cross of St. George on a field of limestone grey. In the centre a round gold circle withing a wreath of candytuft (Iberis Gibraltarica) the inscription The Gibraltar Regiment, within the circle, the Gibraltar Castle and Key in red on a white field. The Imperial Crown superimposed, underneath, a scroll with the motto Nulli Expugnabilis Hosti, on the upper canton next to the staff a grenade in gold. Since the presentation of new colours in 1998, Queen Elizabeth II has bestowed the title 'Royal' on the Regiment and it is expected that the Regimental Colour (together with the Queen's Colour) will be changed to show the new 'Royal' prefix on both Colours. Source: The Presentation of New Colours issued by the Regiment for the parade held on 1st July 1998. My long nearly-lost Latin translates Nulli Expugnabilis Hosti as 'conquered by no enemy'. This webpage seems to show the laying up of these colours in 1998.